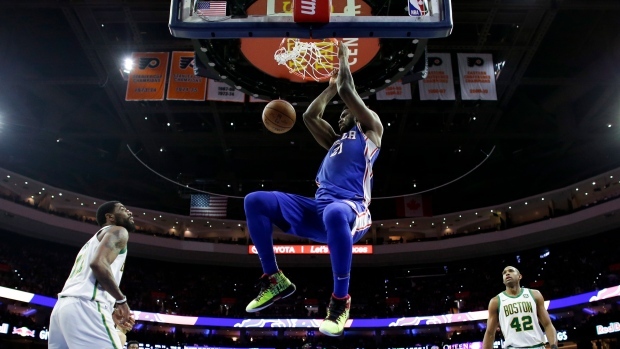 PHILADELPHIA — Boston's recent dominance of the Philadelphia 76ers has been frustrating for Joel Embiid. So when Marcus Smart angrily shoved the star big man to the ground, Embiid had finally had enough. Smart took objection to Embiid sticking his left elbow out as Smart ran past the Philadelphia centre on defence. With Embiid's back turned, Smart gave Embiid a two-handed shove that sent him sprawling toward the sideline. An enraged Embiid got up and went after Smart. Both players were restrained, and no punches were thrown. After an officials' review, Smart was ejected for a Flagrant 2 foul.